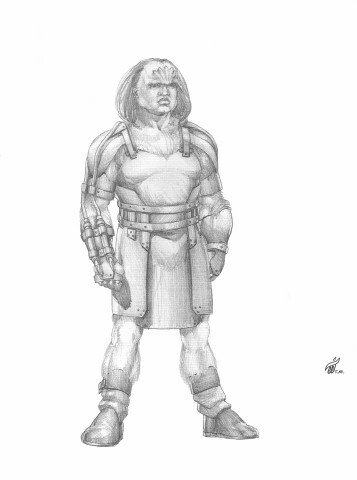 Note #1: This Gorn’s Guard Illustration reveals he and another of his personal guards wear this double metal dart weapon strapped onto their forearm. The pressure hoses connected to them lead to twin metal compressed gas canisters strapped on their backs. Although they are somewhat primitive looking compared to a Mazon beam weapon gun, they are highly accurate and very fast when triggered to hit an intended target. This is one of two personal body guards for the tyrant militaristic leader Gorn on the planet Maldec. This world circled in an orbit around the sun between the planets Mars and Jupiter long ago, before it was blown up by one single experimental bomb weapon. Sen Dar’s influence upon the three leaders of this world, particularly the most violent militaristic leader Gorn, resulted in a very unexpected end to this once thriving planetary culture. As you can see, this original Gorn’s Guard Illustration was created as a pencil illustration or sketch in black and white. However, you should know that the skin of this race has a violet hue to the tough leathery texture and they are very hairy but also obviously humanoid compared to an Earth human being. It is the action Gorn finally decides to take against all his top scientist’s advice to the contrary, that ends in the complete destruction of the planet Maldec. That does not, however, come anywhere near the end of this first episode of The Parallel Time Trilogy. Earth becomes the next target for Sen Dar in his attempt to steal and use all three of the mystic crystals of The Ancient One. Note #2: You can click on the link above to read the Gorn Chapter 20 Excerpt to further explore who these humanoid beings are and how they lived. 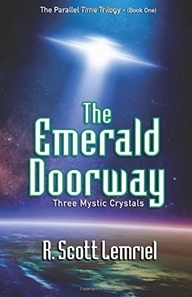 You can also click on the other link to view the front and back covers of The Emerald Doorway (Three Mystic Crystals) book one of The Parallel Time Trilogy and The Seres Agenda book. Also find the provided links beside them that go to the proper page at trusted online retailers where you can obtain the trade paperback and/or the e-book for various e-book readers.